If there's one thing Tesla Motors does well -- aside from making electric sedans with neck-snapping acceleration, obviously -- it's prolonging a tease. After roughly a decade of talking about making a $35,000 car, it's finally here... at least in pre-production form. 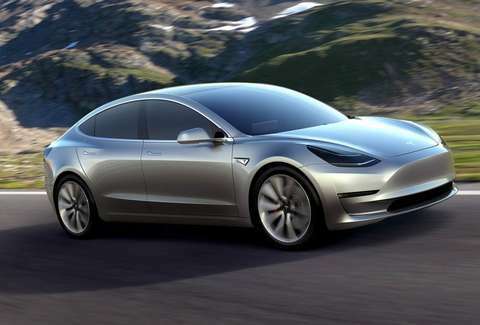 Meet the Model 3; as the first truly mass-market vehicle from Tesla, it's likely to either make or break the company as an automobile manufacturer once it finally starts rolling off the assembly line in late 2017. 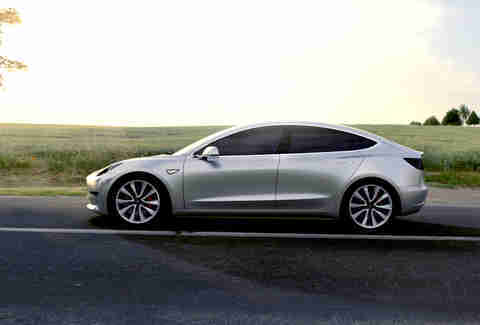 The Model 3 can drive up to 215 miles per charge, hit 60mph in "less than six seconds," and, should you feel the need, you can fit a 7ft surfboard inside. According to Elon Musk, it should achieve a five-star safety rating in every category once it gets tested, and every single Model 3 produced comes standard with Tesla's autopilot hardware. Upgrades? Of course there will be upgrades, but Musk isn't exactly letting those out of the bag just yet. 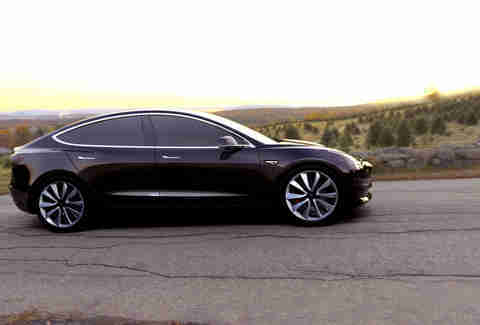 The lack of an internal combustion engine frees up space that the engineers used to refine concepts already proven by the Model S, like cargo areas both fore and aft of the passenger compartment, giving the car a competitive edge in practicality over cars at similar size and price points. The lack of a front grille is sure to be the design's most polarizing feature, simultaneously jarring to some and reminiscent of a handful of cars to others. 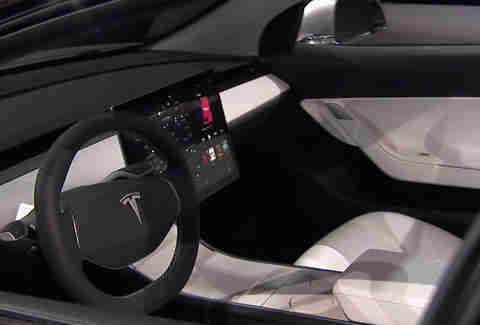 The dashboard, while kept to a minimalist design -- there's no traditional instrument cluster whatsoever, and the whole thing is basically a board with an oversized iPad -- is small enough that the front seats are pushed forward a few inches from where they'd normally be, hypothetically allowing more space for the three adults Musk says can sit comfortably in the back. Speaking of the back, you don't even have to look all that closely to notice that the roof is one giant rear window that arcs forward over the rear passenger area. While this undoubtedly will add weight (and, unless Musk and company have found a way around the laws of physics, will also have a negative impact on insulation), it's also a very clever way to get around the problem of rear headroom. The thick structural supports on the sides are theoretically strong enough that the thin glass isn't a hindrance to rigidity, which in turn enables an extra couple of inches for your noggin. So that's it, then. 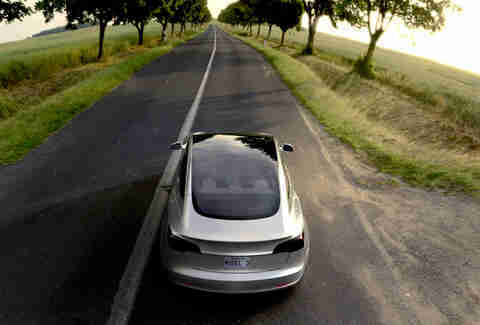 The wait for Tesla's long-anticipated and much-teased $35,000 car is over. For the over 115,000 people who have already ordered one, however, it's only just beginning. Tesla really is good at teasing, isn't it? Aaron Miller is the Cars editor for Thrillist, and can be found on Twitter. He wasn't overly shocked (!) by Musk's claims about the Model 3.